American Angler Electric Fillet Knife - The Last Fillet Knife You'll Ever Need! » American Angler Electric Fillet Knife – The Last Fillet Knife You’ll Ever Need! Are you looking for a fillet knife that will stand up to the big bones and big fish? Well look no further you have found it. The American Angler fillet knife will be the last fillet knife you will ever need! This all in one electric fillet knife set comes with 5 different stainless steel blades. With a 110 volt motor in the handset that hums along nicely like a fine-tuned machine. That is exactly what it is. And its ergonomically crafted handle it will keep your wrists from hurting and you will beadle to fillet more fish. American Angler makes only high performing quality products. These blades are strong durable from a company you can trust American Angler. Big bones slowing you down are in the past because this EFK has 2x more torch than the competition. They Have proven this with extensive tests that have gone on for 10 years. The components on this Pro Series and its design give it 4x the lifespan of its competitors. American Angler Electric Fillet Knife Has The Best Handset in The Industry! The handset is ergonomically designed for comfort. The advanced airflow motor fan keeps the handset cool after filleting for long periods of time. American Angler fillet knife handset is compatible with all the American Angler replacement blades like the 8″ curved Shark Blade and the regular Curved Blade. It’s no wonder why Professional anglers and guides choose this electric fillet knife over the competitions knives. The American Angler fillet knife Pro Series comes with five configurations of blades. This is handy when you are filleting different species of fish with varying degrees of complexity. The blades and the knife itself is backed by a 2-year limited warranty. American Angler stands by their products. The blades on that come with this set are reciprocating two blade power for precise movement when filleting along and through the bones of the toughest fish. These blades can cut through muskie, catfish, lake trout, salmon, redfish, rock cod, and striper like nobodies business. The blades are also useful in filleting smaller fish like panfish, trout, crappies, bass, perch you name it. These blades will get the job done right and in no time flat! 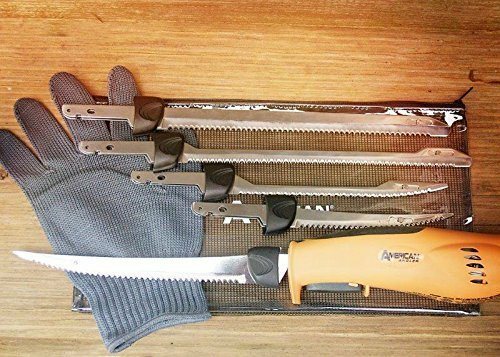 All the blades in this set are compatible with any of the American Angler electric fillet knives. If you have another EFK from American Angler and you need to change the blade type just take on from the pro series and pop it on! Works like a charm. The 5.5″ curved tip blade is excellent and recommended for the smaller freshwater fish you catch like perch and sunfish. This is a great blade to have when you need to fillet some fish after a long day of ice fishing. It’s fast and precise! The 8″ Curved Shark blade is best used in filleting medium-sized fish such as bass, catfish, walleye, crappie, and lake trout. This blade comes extremely sharp and stays sharp long after the competitions blades have gone dull. This blade comes curved at the tip for a more precise fillet. The 8-inch curved tip blade is great at filleting a stringer full of bluegills or any of your freshwater smaller sized fish. It’s even good for some of your saltwater species of fish as well. The 10″ Shark blade is hollow ground like all the American Angler electric fillet blades. With two reciprocating blades so that you can fillet some of the bigger fish you catch like catfish, muskie, salmon, bass, and redfish. This blade is used for some of the biggest fish you can catch out on the ocean such as Tuna, redfish, rock cod, striper. Freshwater fish as well as large catfish and large sturgeon. 10″ heavy duty electric blade can cut through a 75-pound tuna like it was nothing. Professional saltwater anglers stand by this blade. The Last Fillet Knife You Will Ever Need! With the American Angler fillet knife Pro Series you get so much for such a small price! Five Blades, ergonomic handle, advanced airflow motor that keeps the handset cool for longer periods of time and it’s 2-year limited warranty. What more could you ask for in an electric fillet knife? Take the next step and get yourself this fillet knife. I know if you do enough filleting of fish like I do you will not regret it. I bet ya if you take care of this knife it just might be the last fillet knife that you will ever need. Previous Post Clam Ice Fishing Clothing – Beat The Cold In Clam Next Post Selling Fishing Tackle Online – The Secret To Getting Started! Oh where were sites like this when I lived at the beach?! This knife looks like a great addition to anyone’s fishing gear. I hesitate to say tackle box because of possible damage to it from exposure to salt water. Then again, I bet American Angler would stand behind it. The blades included with purchase are all pretty serious choices. Do you think smaller ones would be better in some instances? I noticed the knife will take any of the company’s blades, so it made me wonder. If you are filleting smaller fish like perch or panfish you would want to go with a smaller blade.